Pure Supps Creatine Monohydrate - As the most scientifically supported ergogenic aid of our time, creatine monohydrate is only second to whey protein in terms of its popularity and proven efficacy. Multiple studies have shown creatine monhydrate is without doubt the best form of creatine for putting on muscle and improving strength. It deserves to be found in the cupboard of any individual serious about putting on size. But with such popularity and wide availability, creatine monohydrate should not cost you the earth. Pure Supps Creatine Monohydrate makes for the ideal pure creatine supplement for any individual who's after maximum value but also understands that shouldn't come at the expense of quality. Pretty good creatine after 3 weeks of using I've smashed my original max in dead lifts and it felt easy, I'm also looking a little thicker and full. This has been an absolute gem! Puresupps creatine not only has been the best value for money i can find it's just pure quality! 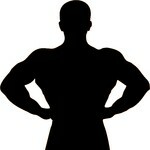 I'd recommend to other serious bodybuilders looking to gain a little more muscle and strength. I’ve noticed steady strength gains. If you want to boost your strength and muscle, give this product a try. What is the best time to take creatine; pre or post workout? When posing this question, it’s important to remember that the benefits of creatine are mediated by the levels in muscle tissue. These levels build up gradually over time, and do not change significantly with administration of a single dose. So the question of whether to take creatine before or after a workout should really come down to what time provides the best absorption. There are a couple of studies showing that creatine absorption and uptake is greater when taken after a workout versus before. However, the differences are not major. The more important factor is to take creatine on a continuing day-to-day basis so as to maximise levels in muscle tissue. Will taking creatine monohydrate regularly have any adverse effect on my kidney health or function? Creatine monohydrate happens to be the most widely studied ergogenic aid in sports nutrition but despite this, there is no substantial evidence it causes any form of kidney disease or damage. This rumour about kidney problems and creatine seems to have come largely from anecdotal reports, rather than any published study. Sometimes when taking creatine monohydrate I experience diarrhoea and bloating. Is this normal? Diarrhoea and associated digestive complaints are among the most common reported side effects of creatine supplementation. However, reports suggest that digestive upsets are more common when larger doses (i.e. 10g and up) are taken. Therefore, one of the most basic and effective strategies to reduce digestive upset caused by creatine is to take doses of 5g or less. If this still causes stomach upset, try taking 2 or 3g. 100% Creatine Monohydrate. No additives. No fillers. Replace lid immediately after use. Store below 30 degrees Celsius in a cool, dry place, out of direct sunlight. Sold by weight not volume. Some settling may occur. Formulated Supplementary Sports Food. This product is intended for use in conjunction with a nutritious diet and exercise program. It is not suitable as a sole source of nutrition. If you have any pre-existing medical conditions, please consult your healthcare professional prior to use. Not recommended for those under 15 years of age, pregnant or lactating women.